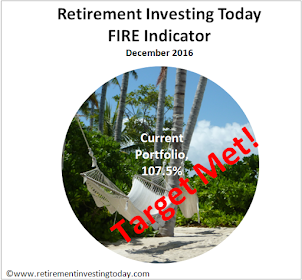 Retirement Investing Today: How long until a house can be bought for 100 ounces of gold? 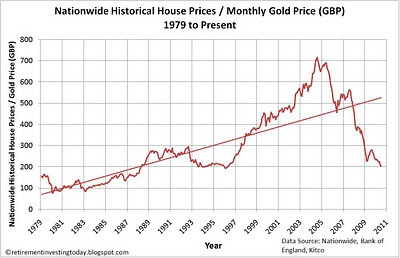 How long until a house can be bought for 100 ounces of gold? For a long time I’ve been saying that houses are overpriced. This keeps my family in rented accommodation as I refuse to buy at these prices. Instead I now watch what looks to be the early beginnings of an unravelling housing market from the sidelines. My last UK house price update was here. Additionally, as I mentioned yesterday while gold is reaching new highs in nominal terms when prices in US Dollars it is not at new highs when priced in British Pounds although admittedly it is close. However, it is nowhere near new highs when priced in real (inflation adjusted) terms and so in my humble opinion still has plenty of upside potential if history is anything to go by. Combine these two markets into a chart and it says a lot. The perfect play looks to have been to sell your house in the middle of 2004 moving your “sold to rent” fund that was released into gold. Looking at today’s chart combined with what I see happening out there in the world I’m pretty happy that I own some gold and am renting. The question from me now is will house prices halve from here, will gold double in price from here or will we see a bit of both. Today’s chart suggests we will see one of these three as the ratio returns to a point allowing an average house to be bought for 100 ounces of gold. I wouldn’t mind betting it will be a small increase in the real gold price and a lot of decrease in the real price of houses. In nominal terms though I really have no idea as that will all depend on how much inflation the Bank of England will be successful in engineering before they are finally satisfied. I also have no idea whether they will succeed in their inflation goal which will erode the debts of the reckless. 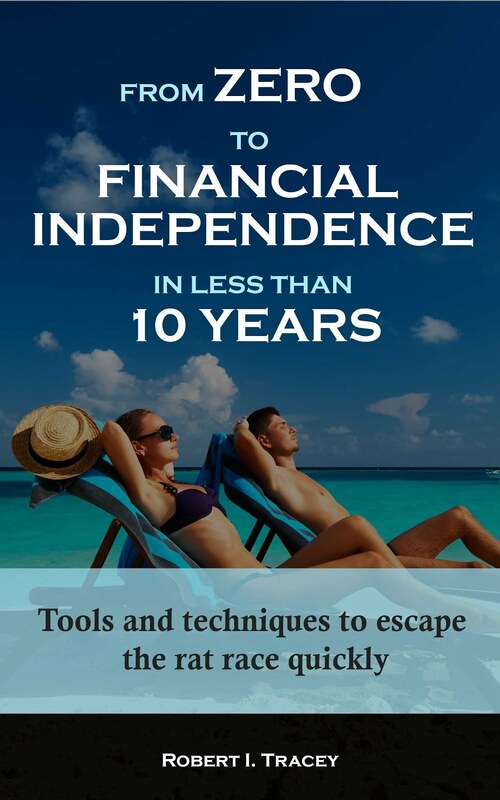 For that reason in addition to holding some gold I also continue to focus on ensuring that I protect the low risk portion or my portfolio against the ravages of inflation while minimising the downside if that inflation is not forthcoming. For now that is 19.2% of my portfolio in NS&I Index Linked Savings Certificates and 1.5% in Index Linked Gilts. RIT, Hello again. I, too, think that house prices will fall and that gold will rise (a little), but I am not sure that I understand your interpretation of the graph. 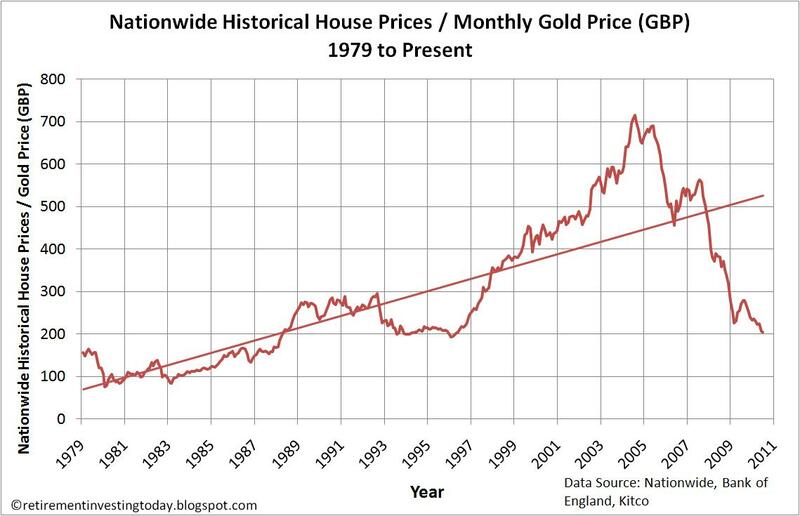 If you think that the trend line represents an enduring relationship, would you not expect a return to the trend pretty soon by an increase in house prices relative to gold? Rampant inflation in the wider economy, I suppose, would effect this quite nicely. I probably shouldn't have put the trendline on the chart in this instance but its just something I always try and do on every chart. In this case the trendline looks skewed as we have seen massive property over valuation and massive gold under valuation in recent years. If I had a larger dataset going back many years I'm sure it would have looked very different - much flatter - but that's guessing because I don't have that data. I'm sure someday in the future we will revert to the trendline again (whatever it looks like by then) but we first have to go through the low of the cycle. I try and think of the economic cycle (boom and bust) as a bit like a sine wave. I'm more looking at the previous lows. We've seen 100 ounces before so why shouldn't we see them again in this economic cycle.